Almighty and everlasting God, whose will it is to restore all things in your well beloved Son, the King of kings and Lord of lords: Mercifully grant that the peoples of the earth, divided and enslaved by sin, may be freed and brought together under his most gracious rule; who lives and reigns with you and the Holy Spirit, one God, now and for ever. Amen. The last Sunday of the liturgical year is Christ the King Sunday. In some traditions, the term “Reign of Christ” is used, but the intent is the same: as the Christian year comes to a close, reflecting as it does the whole sweep of history, we take the time to remember at the end, that in the end, Christ is Lord of all. The task of the day is to consider what that means. What does it mean to call Christ Lord, to call him king? It cannot mean the same thing as calling another King. When we think of Kings, as much as we can being Americans, we probably think of a vast gulf between ordinary people and royalty. Then again, perhaps as Americans we think of royalty in in grander terms than those in countries with monarchies where the fact that royals aren’t all that different from the rest becomes apparent in the press. So maybe the pristinized image we have of royalty is more in keeping with the way people once thought of monarchs before the veil was torn away and they traded divine right for the fickleness of celebrity. So, perhaps, for an American, the word King still connotes an older, grander institution; one where the monarch had ultimate power, and ultimate authority to exercise it. It is helpful to consider this because it helps us understand the world in which Christ was first called King. It helps us to consider what it meant for him to be labeled that way then, and what it means for us to call him by that title now. Of course, those who called Christ King in the Gospels, often did so in mockery. They understood kingship to entail an exercise of power and violence. This was a time and a place where the father of a household had the power of life and death over the other members of the family, and where the emperor was seen as the sort of father-figure of the empire, having the same sort of authority over all his subjects. Coupled with this was the claim of divinity that the emperors made, ascribing divine power and authority to their actions, justifying them with more than simple force. The fact that Jesus did not exercise power or exert authority in the ways that would have been expected–and that to some observers, that he seemed unable to–meant that they could only apply the word to him in jest. They may have executed him for the claim, but they did not take it seriously, especially once he was hanging on the cross. All of which begs the question of why the recounting of the crucifixion would be chosen as the Gospel lesson for Christ the King Sunday. There must be something important for us to learn here. And it is focused on the curious way that Jesus goes to the Cross. He demonstrates mercy for those who are in the process of taking his life in a heinous and cruel manner. “Father, forgive them; for they do not know what they are doing,” he cries out (Luke 23:34). Through the mercy that he shows during a time of such tremendous agony, both to those crucifying him and to the repentant thief, Jesus demonstrates the magnanimity that is the hallmark of true authority and kingship. Jesus shows his word to be true in fulfilling not only the Law and the Prophets, so emphasized by Luke, but his own teaching about forgiveness, offering mercy even as he’s nailed to the cross. This is not what authority and power looks like to the world, and yet it is an exercise in the most astounding sort of authority: God, freely giving himself to death in order to ultimately save his people from the same fate. The creator of the universe becoming the ultimate scape-goat, to demonstrate that there is no longer any need for scape-goating. The sacrifice of sacrifices, ending all sacrifices. Because of this, the mockery of the masses is doubly ironic. In mocking Christ by placing the sign “King of the Jews” above his head, they thought themselves to be drawing attention to the distance between the authority and power of a king, and what was happening to Jesus. But they were actually proclaiming a truth much more fundamental than they could have known. And so the Cross is transformed from a gruesome instrument of torture into a throne from which the King pronounces mercy and pardon, displaying true authority and power even at the point of ultimate weakness. We have been shaped by Christian history, and so the contrast, while still stark, might be hard for us to fully grasp. Perhaps looking at the way those who have been more recently exposed to the Gospel talked about it could be helpful. One of the most intriguing pieces of literature I read while in college was a medieval English poem entitled the Dream of the Rood. For those of you who have been in churches with Rood Screens, you probably know that “Rood” is an old English word for Cross (from the same root as Rod). “Then I saw the Lord of all humanity come toward me quickly, bravely, for he meant to climb up on me. Then I did not dare to bend or break, to contradict the command of the Lord, when I saw the earth’s surface quake. I could have felled all the enemies about me, had I fallen, but I stood firm. And that young man, who was almighty God himself, stripped off his clothes–so resolute, unflinching. He mounted the hateful gallows , unbowed beneath the stares of many, since then, it was his will to be redemption for mankind. When the man embraced me, I quaked, I shook; nonetheless I dared not topple, collapse onto the face of the earth. I had to–and I did–stand fast. Raised aloft a cross, I lifted up the mighty king, Wielder of the heavens. I did not dare to fall. They wounded me through with dark nails: the hurts are here on view upon me, gaping, evil spreading gashes. But to none of them dared I do harm, though they humiliated both of us together. And after he, that warrior, sent forth his spirit, the blood-flow from his side soaked me. The gospel reversals are many. For the Anglo-Saxons, Christ as the chieftain who embraced a shameful death, who did not lash out at his enemies. Once they embraced Jesus as King, the actions of Christ transformed the way the Anglo-Saxons looked at Kingship and eventually at government, just as happened in other cultures. But despite the many transformations wrought by the influence of the Christian tradition, there is still a vast gulf between the way we tend to believe authority and power are rightly exercised and the way Jesus exercises them both. We live with that tension, and our task as Christians is to continue bending our expectations and desires to match the example that Christ has given. To paraphrase the words of today’s collect, Jesus is the only King whose rule brings freedom. He himself declared that his yoke is easy, his burden light. Most of all, Christ is the only one whose death brings life. 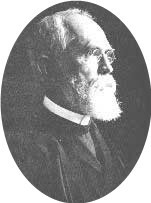 The great Methodist missionary Stanley Jones called the Cross Christ’s “Professorial Chair,” the place from which his teaching is done. The Cross is likewise his throne: the throne of the King who shows the ultimate mercy to his people. And it is a method of execution, but one that resulted in the temporary death of God, so that eternal life might be the reward of his people. It’s worth thinking about how differently things work in the Kingdom of God, and Christ the King Sunday is a good reminder of that. Amen. As Anna often reminds me in a joking way, I tend to remember a great deal of what I read or hear. I can often remember about where a phrase or comment occurs in a book, enough of a magazine article to look it up several years later (assuming it’s accessible to Google) etc… Given this, you might understand my frustration at not being able to find a poem which contained a line that I thought would be a wonderful illustration of the Anglican pastoral tradition, and the respect for even the most mundane of everyday tasks that it lifts up. As you can see, I somehow misremembered the line. I think I summarized it that way for someone, perhaps in the midst of a chapel devotional, and it got stuck in my head as “to sweep the floor as though for Christ.” At any rate, It’s good to know I’m not completely mad, or dreaming things up. If you’d like to read The Elixir in its entirety, click below. 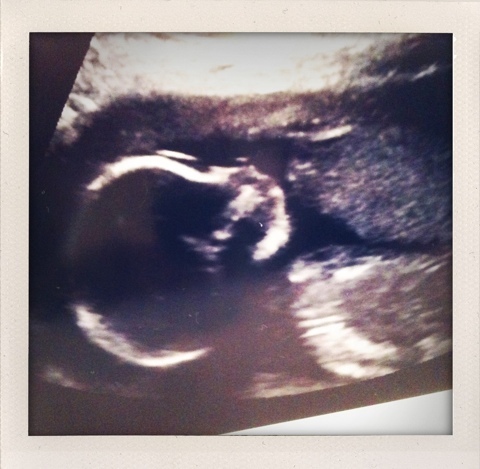 Anna and I officially met Eli Joseph Howard this morning and look forward to his arrival in April! Eli’s First Movie from Joseph B. Howard on Vimeo. This morning Anna and I have an appointment that is supposed to tell us whether the baby we’re awaiting is a girl or boy. Obviously our only preference is that TLH (that’s “The Little Human” or “The Little Howard”) be healthy. I’ve had a growing anticipation of this day, despite the fact that Anna (planner that she is) initially had to convince me that finding out was the better option. This anticipation isn’t based on the fact that we’ll be able to buy blue or pink paint (I don’t think we’ll use either actually) but is fueled by the fact that today we’ll be one step closer to actually meeting our baby. We get to move on from “TLH” and start using a name–you’ll find out later today. In effect we get to say “hello, who are you?” today. Jesus is in Jerusalem teaching in the Temple in this section of Luke’s Gospel, as he comes closer and closer to the time of his betrayal and crucifixion. He’s there challenging the received wisdom of the scribes and pharisees, defending himself against attempts to discredit him or show him as a law breaker. In some respects this is not friendly territory. And yet, it’s important to understand exactly what the temple was, and what it represented to the Jews of the day. To all the Jews of the day. It might be true that certain parties held sway of this or that aspect of temple life. But this was still the temple. 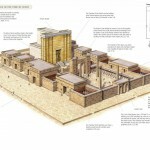 This was the temple of the God of Israel, the heart of Israel and the spiritual heart of the people. All Jewish people, most of whom didn’t identify with particular religious parties, came to this temple to offer sacrifice and to pray to the God of Abraham, Isaac and Jacob. Add to this strong, foundational connection, the structure of the temple itself. Impressive not only in its overall size and impression, but in the enormous size of the individual building stones used in its retaining wall (one of the remaining stones, for example, is estimated to weigh 570 tons). The temple itself was built with white marble, standing in high contrast to the local stone, and gleaming in the daylight atop a foundation approximately twice the size of the Acropolis in Athens and taking up about 1/6th of the city. It must have been a wonder to behold. It is no surprise that the conversation turned to the beauty of the edifice, about how it was adorned with stones and contained gifts dedicated to God. The disciples have been with Jesus long enough to expect his answers to be difficult to follow from time to time. They haven’t quite figured out what all his references to the Son of Man being handed over and mocked mean (cf. Luke 18:31-34), but this comment is different. When the first temple was cast down, the people of Israel had gone into exile and struggled with the question of God’s abandonment, with whether they were being punished for their sins. Imagine the concern they felt hearing Jesus’ words. Jesus recognizes their concerns and understands their fears. He wants them to understand that the destruction of the temple he foretells is not the end, it is not part of the second coming, but is a day coming imminently (70 AD to be exact). Tragedy will occur, but history will go on. Jesus recognizes how easily we can put our trust in things made with human hands–after all, we can create so wonderfully, imitating the Creator whose image we bear. We tend to think of certain things as permanent, even though they exist in impermanence (Peter Berger has written memorably about this in The Sacred Canopy and The Social Construction of Reality). This is the struggle the disciples are facing. Does the destruction of the temple, in all its grandeur, mean the end? Will the destruction of so great an icon mean the end of history? Is the Day of the Lord, foretold in the prophetic tradition, connected with it? Jesus anticipates these thoughts, and he warns his followers–warns us–not to put stock in the words of those who would gain attention and frighten people by declaring the end of days: “Beware that you are not led astray” he says, “for many will come in my name and say, ‘I am he!’ and, ‘The time is near!’ Do not go after them.” The implication being that the second coming will be such that no one will require convincing. In contrast, fear mongers and charlatans have always and will always exist: do not be taken in by them. In other words, these events point to the immediacy of the Kingdom of God precisely because they testify to the fact that the world is not yet as it should be. They serve as a reminder of the need for the Day of the Lord, when wrongs will be righted, as well as a portent that the day is coming. But there is no simple formula, and this serves as an overview of what sorts of things will come, but not immediately. Christ is with the persecuted. The Kingdom of God will break through at the most unexpected time. This is indeed good news for those who are about to endure persecution, and that good news is what enabled them to face their trials with faith, so that, to paraphrase Tertullian, the blood of Christians could become seed. This is good news for us today as well. We do not know what may come in our lives, but we can be assured of the constancy of Christ. Jesus will be with us, regardless of the difficulties we face. There are those who attempt to spread fear of the end, but we know that we have been given all we are to do to prepare: to love God and love our neighbors as ourselves. We gain the strength to do these things through the sacraments that Christ ordained in Baptism and the Lord’s Supper. These are the habits of life that will enable us to face the worst the world can throw at us. It may sound strange, shaped as we are by other ways of thinking, but the Kingdom of God stands against the antagonism and persecution of the world, and it comes into reality in the Body of Christ, a people gathered together in his name. This is why William Cavanaugh, in his book Torture and Eucharist can see that within the practices of the Christian community–chiefly the Eucharist and care for the dead–people found the means to resist the tyrannies that spread through South America and maintained control through torture, kidnapping and murder. In that struggle, the juntas worked to ensure that those who were killed were unidentifiable, to instill fear, spread uncertainty and deny focal points of resistance. But they couldn’t hide what they were doing forever, and once the Body of Christ could point to specific actions and say “Why are you persecuting me?” it was able to find the means of resistance. This has been the work of martyrs since the earliest days of the Church: they stand as a witness to a greater power than the one that presumes to take their life. All of this is Good News, even for us, though we have no real cause to see ourselves as oppressed or persecuted. We live in a country where we can gather freely for worship, where we can practice our faith and aid our neighbors. We should give thanks for that. But we should also consider this. In 2002, an Italian scholar published a study, attempting to account for the number of Christian martyrs. According to his work, there have been roughly 70 million Christians martyred for their faith. Of these, approximately 45 million, or 65% of the total, were martyred in the 20th century. We still live in a time of martyrdom, where the faithful find themselves dragged before magistrates and thrown in prison and killed. In Europe and in America the relative peace with which the faith has existed has allowed the development of theologies that have denied this, that have lulled us into thinking that we should look to the future, to the time before the Day of the Lord for persecution. But we’re still living in history, and history is the time of martyrdom. Despite this, Christ’s promise still rings true: “not a hair of your head will perish. By your endurance you will gain your souls.” The 20th Century has been called the bloodiest century on record in the history of the world, so when we think about it, perhaps we shouldn’t be surprised that more Christians were martyred in the last century than in any other. But couple that with the fact that Christianity grew more in the 20th century than in any other as well, and perhaps we can begin to see the reality of Christ’s promise taking shape, not only for the martyrs, but for those left behind as well. Perhaps this assurance will help us all as we face our little martyrdoms from day to day, as we deal with tragedy and pain. It should inspire us to live with joy, and to be thankful that we have been given the things to do, the habits of life, that will enable us to face even the gravest persecution. And perhaps, as we rejoice, we will find ways of taking advantage of the freedoms we enjoy to aid our brothers and sisters around the world who face oppression every day. Amen. “Torture is therefore an ecclesiological problem, to do with the church’s nature as a communal body. The church cannot confront the torture system simply by treating it as a violation of any individual’s human rights. From the church’s point of view, torture should be read as aspiring to the disappearance of the visible body of Christ. The techniques of invisibility which the secret police structure perfected were capable of fragmenting the church body while depriving the church of martyrs, visible witnesses to the conflict between the church and the powers of the world. The bodies of the martyrs make the church visible as the body of Christ. The church does not seek martyrdom; to do so would be to invite oppressors to sin, which would be a grave sin in itself. The church also does not recognize all victims as ipso facto martyrs. The church does, however, celebrate certain people as martyrs, for they make visible the community of Christ’s followers. Martyrdom is never a goal, but the church knows that as the body of Christ it will inevitably come into conflict with the disciplines of the principalities and powers.” –William Cavanaugh, Torture and Eucharist, (p 70-71). What I have found is that each of these resources have strengths and weaknesses. From the time I was in college through the end of seminary, I probably preferred the New Oxford Annotated Bible above all others because of its focus on historical context. I appreciated the fact that it left any theological conclusions more or less up to the reader. As I have engaged in pastoral ministry, I’ve come to appreciate the New Interpreter’s Bible much more–and while it’s not a huge thing, I liked the fact that it correctly represented the Anglican “stepped canon” in its introductory material. I’ve also appreciated the ESV Study Bible for it’s solid notes. But the thing I appreciate most about the ESV Study Bible is actually the fact that owning it has given me access to the website http://esvonline.org. While some people may be concerned about the perspectives of the ESV translation and editorial team, they’d be hard pressed to deny that Crossway has been head and shoulders above other Bible publishers when it comes to marketing their translation and–most importantly–providing useful online tools for their readers. I’ve found myself using ESV online as my primary computer bible and note-taking tool. I’m curious to see what others are using… comment away. “Now he is God not of the dead, but of the living; for to him all of them are alive” (Luke 20:38). I’ve discovered that Nashville is an interesting place to be if you’re involved in any way with churches. The Methodists and at least two Baptist groups have their headquarters here. I found out recently that Church Publishing, the Episcopal Church’s publishing house, is moving their distribution center from Harrisburg PA to Nashville–not sure what that might mean except that it highlights the intersections that exist here between various industries and the institutional structures the various denominations have put together to–ideally at least–support the mission and ministry of their local congregations. And being in this area, with all of its connections to the different denominations and thinkers, it means that I hear of or have been involved in any number of conversations about the problems confronting our congregations today. One of these problems is declining attendance which is spurred on by an even more fundamental problem: fewer people actually identifying as Christian–or at least being involved in any sort of Christian fellowship. There are many reasons for this. We could pull out sociologists, anthropologists, theologians, church development gurus and maybe even a physicist or two (I’m barely joking) and consider their ideas about why this is happening. But I don’t think we need to. Today we should consider a key ingredient in this stew of negativity and it is simply this: People aren’t sure why they should go to church anymore. Some of them may have decided that they don’t need to go to church to worship, but I think a greater number have found themselves in the situation that they can’t come up with a good reason to worship, or maybe they’re unsure how. There are surely times when some of us here today might discover, upon reflection, that we’re simply here out of habit. Regardless of what the ultimate underlying psychological reasons might be, there are lots of little things in our lives that call into question the offering of time each week to the communal worship of God. It’s called into question because the point has been obscured, made to seem less important or even, in some cases, discredited or silly. In the Gospel lesson we see something similar taking place, this time between two different religious schools of thought in Second Temple Judaism. At the time the majority of Jews–the Pharisees and Jesus among them–believed in the bodily resurrection of the dead. In most cases this belief was based primarily upon texts from the prophetic books–such as Ezekiel’s vision of the valley of dry bones. The Sadducees, unlike the other Jewish groups, did not accept the idea of the resurrection, in part because they did not consider the prophetic books to be scriptural or to be on the same footing as the Torah (the five books of Moses). In their attempt to discredit belief in the resurrection they made two assumptions that Jesus is going to take on directly. They believed that resurrection described a return to life as it is–therefore the woman must have to be someone’s wife–and they assumed that the Torah was in conflict with the prophets. But, as Luke wants us to understand, they were matching wits with the one who is the fulfillment of both the law and the prophets, the one who can demonstrate the fullness of scripture. The Christian faith is firmly rooted in the truth that God loves us so overwhelmingly that he sent his Son to save us from ourselves, from our sin, and ultimately from the death that is the ramification of that sin. A salvation that does not include salvation from death is no salvation, and without the hope of the resurrection, with Christ as its first fruits, we are truly as Paul wrote, most to be pitied among all people. And so when we reflect on what brings us here Sunday after Sunday. When we consider what draws us to give praise to God, it can be nothing less than the confession of hope: Our God is God of the living, and those who die in him do not ultimately die, but rest in him awaiting the day when we will all see one another again, clothed in bodies like that of the resurrected Christ. Perhaps this confession looks absurd to the Sadducees of today. Perhaps the doubts they spread give us pause. But we come here, confessing our hope, receiving the sacraments and with them the grace of God, and we move forward. 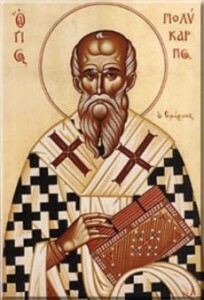 We may say what we please about the anthropomorphism of God’s wrath or vengeance; translate it into terms of those natural consequences of our sins, negligences, and neglects with which we ought to be well enough acquainted as facts of experience and I do not know that there would be much gained in the way of softening or tempering. All the temperings of natural consequences or penalty to which we we may trust must come along the lines of grace. There is all the tempering possible provided in the Gospel of Jesus Christ. To refuse or neglect that is to cut ourselves off from all possibility and therefore all hope of mercy (p. 211-212).